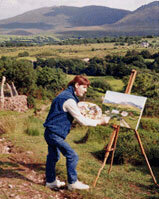 The artist in the mountains of Killarney. Click Here to find out more about Mary McSweeney and her inspirations. Planning a trip to Cape Cod? Welcome to my Ireland. Born and raised in Killarney, I have sketched and painted the familiar surroundings of my homeland... Ross Castle, Achill Island, the Gap of Dunloe, the Cliffs of Moher, The Donegal Coastline, Glendalough, Croagh Patrick, Blarney Castle, the Carrig Aonar...ever since I was a child. After completing my formal art training at the Cork College of Art and Design, I began to paint professionally the beautiful landscape, the simple events and the everyday people that is the true Emerald Isle. Whether it's my mother's house nestled in the hills or my sons Kerry and Daniel playing on the beach or an old man walking through the meadow, or simply the places and the people that I see, I know I have to paint them, to preserve them on canvas, to capture the essence that is Ireland. Even though I live on Cape Cod now, I return to Ireland frequently to sketch and paint. All of my paintings reflect a love of my homeland and respect for my country-men and women. All of us who are Irish or simply love Ireland are bound together by that love for this land of soft green hills and valleys, of windswept rocky coastlines, and for the welcoming smoke that rises from the hearth of an Irish home. Since I paint with oils, the realism of what I see can be captured by my brush, and my fond familiarity of the subject breathes life into the painting. I hope you enjoy my paintings. Each one is uniquely Irish and I'm happy to be able to share them with you. Copyright Mary McSweeney. All Rights Reserved.